The EUR/USD is pulling back today after bouncing off of our previous 1st tier uptrend line. The EUR/USD failed to break through our previous 2nd and 3rd tier downtrend lines on Thursday, and instead opted register a brisk decline despite a lack of econ data economic data besides EU Industrial Production (0.3% vs. 0.6% expected). However, today’s wave of econ data shows that yesterday’s pullback was warranted. German and French Prelim GDP numbers both came in below analyst expectations while the EU Flash GDP figure printed weak as well (0.4% vs. 0.6% expected). Today’s wave of disappointing data tacks onto Tuesday’s negative ZEW Economic Sentiment numbers. Hence, this week’s data flow indicates that the EU’s economic recovery is occurring at a more gradual rate than anticipated. This realization is putting relative downward pressure on the Euro, as exhibited by the downturn taking place in the EUR/GBP following a consolidation period. Hence, the ECB may be hard pressed to tighten its alternative liquidity measures come December, although we will have to see how upcoming data points pan out. Meanwhile, yesterday’s better than expected U.S. Unemployment Claims data failed to excite investors, indicating the bulls may be running out of steam. We’re currently waiting on Prelim UoM Consumer Sentiment. However, we have already received data showing the U.S. Trade Balance widened more than anticipated and import prices came in 4 basis points below analyst expectations. Therefore, a weak consumer sentiment number could drive the S&P futures into negative territory today and possibly extend intraday lows in the EUR/USD since the two investment vehicles are positively correlated. Despite present weakness in the EUR/USD, the currency pair does have a few more technical cushions to fall back on should today’s pullback accelerate. 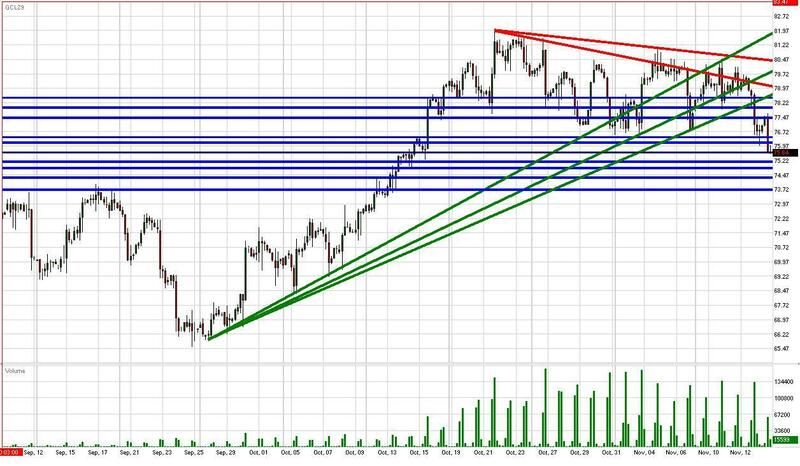 We’ve initiated three new uptrend lines to go along with our previous 1st tier uptrend line (now our 4th). Our new uptrend lines are tightly spaced, indicated there could be some heavy support around this zone should it be tested. In addition to our new uptrend lines, the EUR/USD also has 11/06 and 11/02 lows serving as technical cushions along with November lows should they be reached. As for the topside, we’ve readjusted our downtrend lines to compensate for present weakness. Therefore, the EUR/USD still faces multiple downtrend lines along with 11/05 and 10/15 highs. Meanwhile, the currency pair is drifting further away from its highly psychological 1.50 level, making accelerated topside movements more difficult to attain. Monday’s trading session will kick off with a bang as we receive Japan’s Prelim GDP, EU’s CPI, and Retail Sales data from the U.S. As a result, recent volatility could carry over into next week’s trading session. More weaker than expected econ data results, particularly U.S. Retail Sales, could place further downward pressure on the EUR/USD and test the patience of the currency pair’s uptrend lines in the process. The GBP/USD is topping out just below 1.67 after strengthening yesterday despite a sizable weakness in the EUR/USD. The Pound’s relative strength is highlighted by a pullback in the EUR/GBP, and stems from Britain’s much better than expected Claimant Count Change number from Wednesday. Britain’s relative inactivity on the newswire after this data release has allowed the GBP/USD to hold up pretty well considering investor uncertainty over the last 24 hours. However, although Britain has been quiet, today’s econ data from the EU and U.S. have been disappointing all around. The EU’s GDP data came in below analyst expectations, confirming that the EU’s economic recovery is occurring at a more gradual rate than anticipated. Meanwhile, the U.S. Trade Balance widened, Import Prices printed 4 basis points light, and the Prelim UoM Consumer Sentiment number is discouraging. The S&P futures and crude are both moving lower in reaction to today’s wave of data, meaning the GBP/USD may not be far behind due to the Dollar’s negative correlation with equities. Furthermore, investors should keep in mind that BoE Governor King announced that the central bank is still open to addition liquidity injections should the conditions warrant it. Therefore, if U.S. equities selloff today, the Pound’s excitement over unemployment data may wear thin. Technically speaking, the GBP/USD has some solid near-term supports in place due to the Pounds recent relative strength. The Cable still has our 1st and 2nd tier uptrend lines serving as technical cushions along with 11/12 and 11/05 lows. Additionally, the Cable’s psychological 1.65 level could work in the currency pair’s favor shout it be tested. As for the topside, the GBP/USD also faces multiple downtrend lines along with 11/11 and 11/09 highs. If the Cable should break through these technical barriers, the psychological 1.70 level should serve as the next important topside technical. Meanwhile, investors should keep an eye on the S&P futures and well as monitor gold’s ability to hold above $1100/oz. The USD/JPY has managed to bottom out above 11/11 lows and our 2nd tier uptrend line despite a pullback during the Asia trading session. The USD/JPY’s behavior has been erratic lately as investors debate how to deal with the currency pair’s highly psychological 90 level. Therefore, the USD/JPY has been a tough read the last week as far as correlations are concerned. However, a near-term pattern could development at the beginning of next week with the release of Japan’s Prelim GDP data along with U.S. Retail Sales. Stronger than expected GDP data combined with weak Retail Sales could lead investors to prefer the Yen over the Dollar, thereby weakening the USD/JPY. Such an occurrence isn’t out of the question considering China’s Retail Sales and Industrial Production data outperformed earlier this week while America’s UoM Consumer Sentiment number disappointed today. We’ve witnessed an increase of import demand from China, and Japan likely benefitted from this development considering China is its largest trading partner. However, we will have to see how the data pans out before proceeded with more in-depth fundamental analysis. Meanwhile, the USD/JPY still has our 1st and 2nd tier uptrend lines serving as technical supports along with 11/11, 11/02, and 10/14 lows. Therefore, the USD/JPY has quite a few technical cushions in place should conditions deteriorate. As for the topside, the USD/JPY is still mired in its long-term downtrend and faces multiple downtrend lines along with 11/12 and 11/06 highs. Furthermore, the psychological 90 level serves as both a technical cushion and barrier. Therefore, the USD/JPY may need a sizable jolt to proceed in a more definite direction. Gold experienced a 2nd retracement to the psychological $1100/oz level after topping out around $1120/oz. Gold’s weakness came with pullbacks in both the EUR/USD and AUD/USD as investors locked in profits and headed for safety amid slight investor uncertainty. However, gold is bouncing off $1100/oz and our 2nd tier uptrend line as the EUR/USD, AUD/USD, and S&P futures recover some of their intraday losses despite a wave of negative econ data from both the EU and U.S. EU GDP and U.S. consumer sentiment data releases all printed below analyst expectations, indicating the global economic recovery may be more gradual than anticipated. The S&P futures initially reacted negatively to the news, yet investors are trying to pull the futures back up towards 1100. However, it’s difficult to imagine the markets will end the day positively considering there’s not much of a silver lining to today’s data flow. Regardless, gold has held strong above $1100/oz despite two retracements. Therefore, the precious metal’s upward momentum is still intact, though the uptrend’s patience is being tested. After all, gold has been on a furious rally lately and some profit taking would not be out of the ordinary. Meanwhile, investors should continue to monitor activity in both the EUR/USD and AUD/USD since gold is more closely correlated to these two major Dollar crosses. Technically speaking, we’re still not able to place a downtrend line on our chart with confidence, meaning 11/12 highs will serve as the next topside barrier. As for the downside, gold still has multiple uptrend lines serving as technical cushions along with intraday, 11/10, and 11/05 lows. Meanwhile, $1100/oz could continue to have a say due to its psychological relevance as of late. The S&P futures are trading positive right now despite much weaker than expected UoM Consumer Sentiment data. The S&P’s resilience is a bit odd considering the EU’s GDP data also printed weaker than anticipated. Therefore, what we take from current strength in U.S. equities is that the widening of the U.S. Trade Balance indicates an increase in demand for imports, and thereby a higher rate of domestic consumption. Hence, the larger than expected decline in the U.S. Trade Balance might even be counteracting the disappointing Consumer Sentiment numbers. As a result, the S&P futures are heading back towards previous 2009 highs along with the highly psychological 1100 level. Meanwhile, investors may opt to wait for Monday’s key Retail Sales data before making a more solid conclusion about the present state of U.S. consumption. The Retail Sales data will print along with the Empire Index and Business Inventories. Furthermore, Fed Chairman Bernanke will address the public and Japan will announce its Prelim GDP late Sunday EST. Hence, it seems next week may kickoff with a bang with an increase in volatility. Investors should keep an eye on the EUR/USD’s ability to strengthen from 11/06 lows as well as gold’s ability to continue its upward momentum above $1100/oz. Any considerable technical development in either could serve as a leading indicator for the S&P futures due to their positive correlations. Technically speaking, the S&P futures have limited topside resistance in the form of 1100 and previous 2009 highs. Therefore, the potential for an accelerated near-term breakout exists. As for the downside, the S&P potentially has multiple uptrend lines serving as technical cushions along with 10/22 and 11/06 lows. Additionally, the psychological 1075 and 1050 levels could work in the S&P’s favor should they be tested. Crude futures are adding onto yesterday’s pullback after UoM Consumer Sentiment printed much weaker than analyst expectations. However, crude has managed to stabilize after yesterday’s selloff sent crude tumbling towards the psychological $75/bbl level in reaction to a strengthening Dollar and a larger than expected weekly inventory surplus. Crude finally chose a direction after its incessant consolidation around the psychological $80/bbl level. Unfortunately for bulls, crude’s dip below our important 1st tier uptrend line resulted in more accelerated immediate-term losses. Our 1st tier uptrend line runs through October lows, meaning that a recovery back towards our 1st tier could indicated more losses in the near-term. Crude futures won’t be short of news to move off of since investors will receive Retail Sales and Manufacturing data from the U.S. on Monday along with Prelim GDP numbers from Japan late Sunday EST. Retail Sales can be a market mover for crude since they can serve as a reading for the state of overall consumption in the U.S. economy, and thereby demand for crude. Positive Retail Sales data could help counteract today’s disappointing UoM reading. On the other hand, disappointing Retail Sales numbers could exacerbate crude’s present pullback. Meanwhile, investors should monitor the EUR/USD’s ability to recover from intraday losses as well as gold’s resilience above $1100/oz. A substantial deterioration in either investment vehicle could place further downward pressure on crude due to their positive correlations. Technically speaking, the $75/bbl level could prove to be a reliable psychological support should it be tested. As for the topside, crude faces multiple downtrend lines along with 11/12 and 11/04 highs. Additionally, the psychological $80/bbl should continue to serve as a hefty psychological barrier should it be retested.